1. Find a cache in one new country. 3. 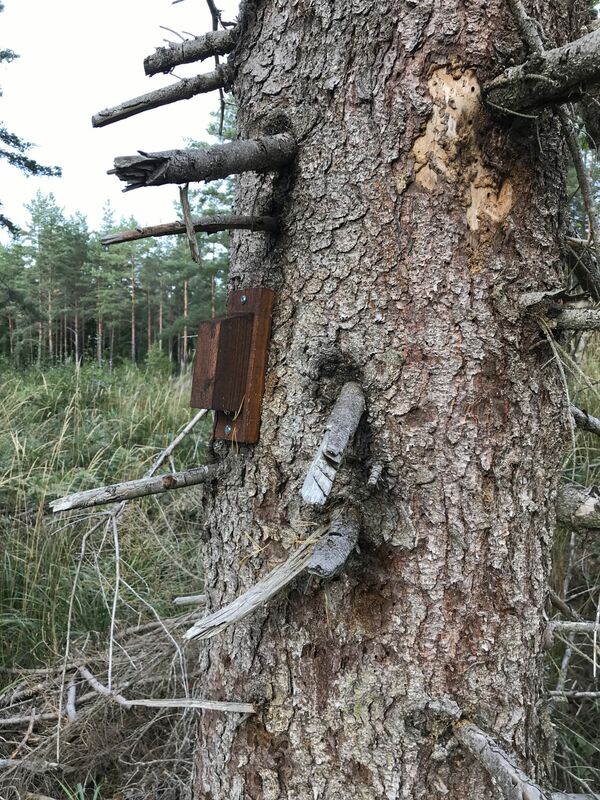 Find 10 large caches. 6. Find caches in all boroughs of one Swedish county that is not yet complete. In other words a very low key set of targets. It imagine that it reflects how I am looking on geocaching at the moment. 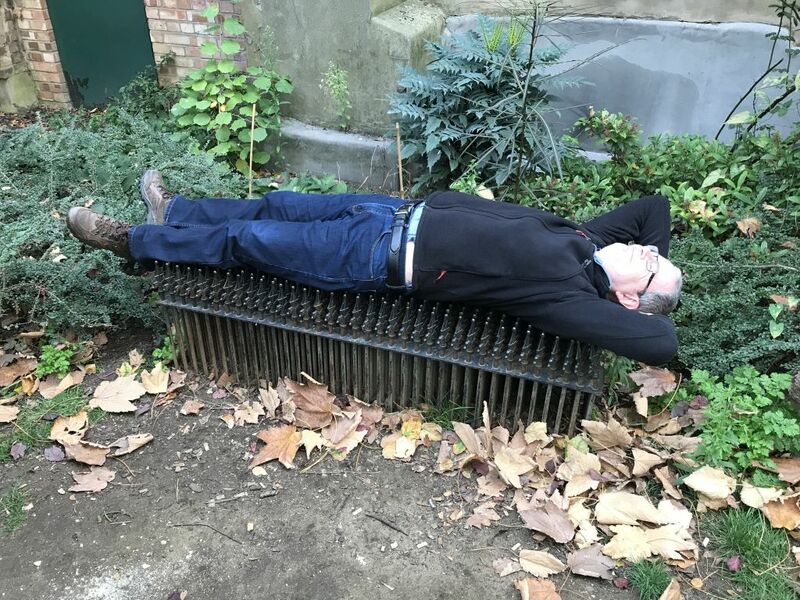 I should have more time for geocaching as I retired in May 2018, but for some reason time has passed and little has been achieved. I hope that 2019’s SMART targets will be met as it’s always satisfying to meet targets! For those who have noted my previous years targets will see that target 5 is there again for the sixth year (I posted a note on the log page 2013-01-27) and I just don’t seem to find the last letters needed. I am missing cache owner names beginning with Q U and W. Only one is actually needed to log a find on the cache as two wild cards are allowed. How difficult can it be? 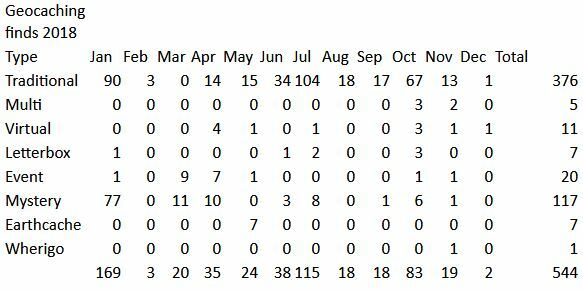 Hang on a moment, you will say 2018 has passed and there were no targets published in the blog! That’s true, but I did have geocaching targets for 2018 and they were the same as for 2017 as I hadn’t been very successful in meeting them then either. So this is what was in store for 2017 and 2018 and how I did. 1. 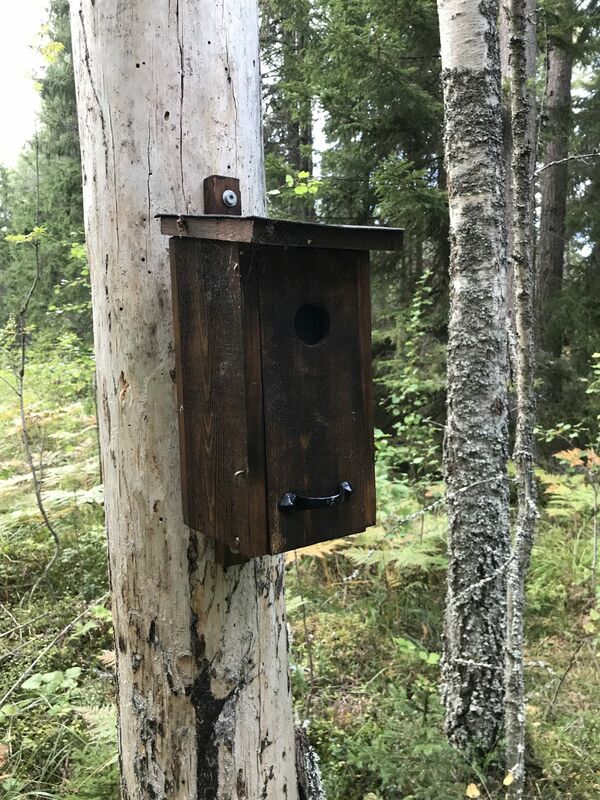 Find at least one cache in Norrland. 2. 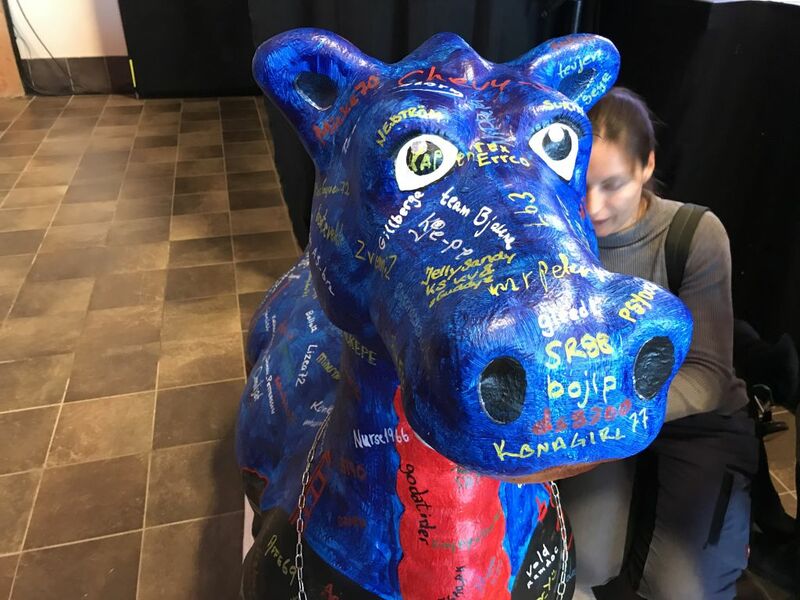 Find at least one cache in ten new boroughs of Sweden. 3. Find caches in at least three more countries. 4. Find at least ten more earthcaches. 5. Place at least three new caches with different D/T ratings or types. 6. 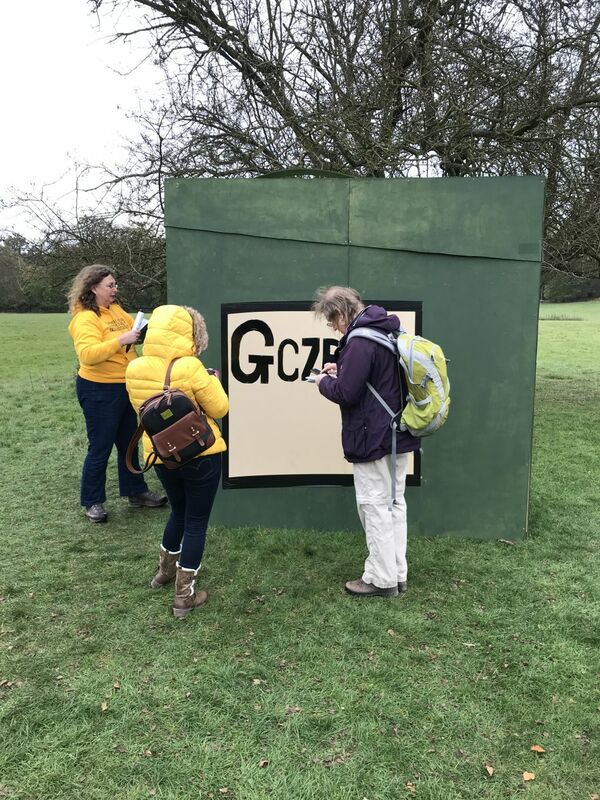 Find the 3 remaining puzzle caches to complete the Questionable COs: A-Z Roll of Honour Challenge. FAIL I didn’t meet the first two targets. Zero activity in that area. PASS I found caches in 2 new countries (Albania and Isle of Man). FAIL I found 8 of 10 earthcaches. FAIL I placed no caches. FAIL I didn’t find any of the missing puzzle caches needed. PASS I met the first two targets. 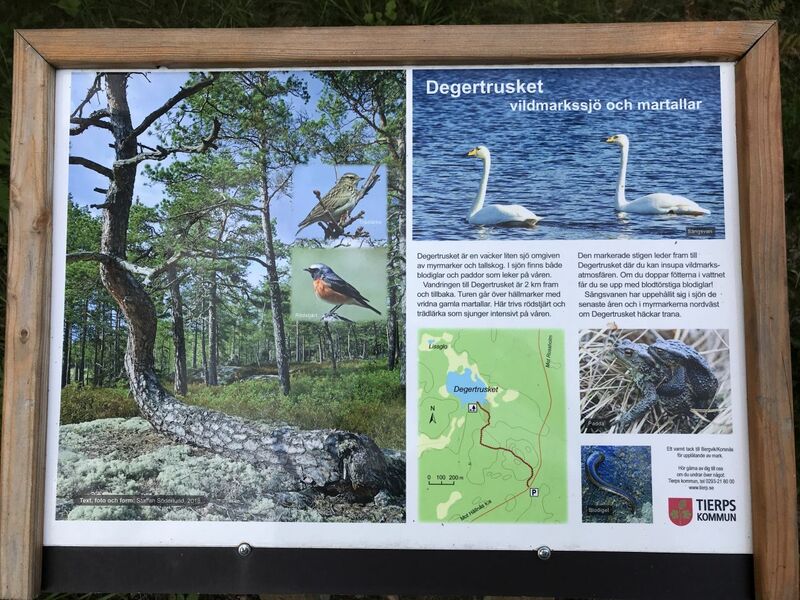 We finally made the Norrland trip as posted in in the blog during the summer. PASS I found caches in 2 new countries (Italy and Vatican City). FAIL I found 7 of 10 earthcaches. It doesn’t take a lot to realise that either the targets were unrealistic, circumstances were adverse or I have lost interest in geocaching. Perhaps it is the latter although my activity during 2018 has been on a similar level to previous years. I have just not focussed on the targets. So what’s in store? Read the next post! 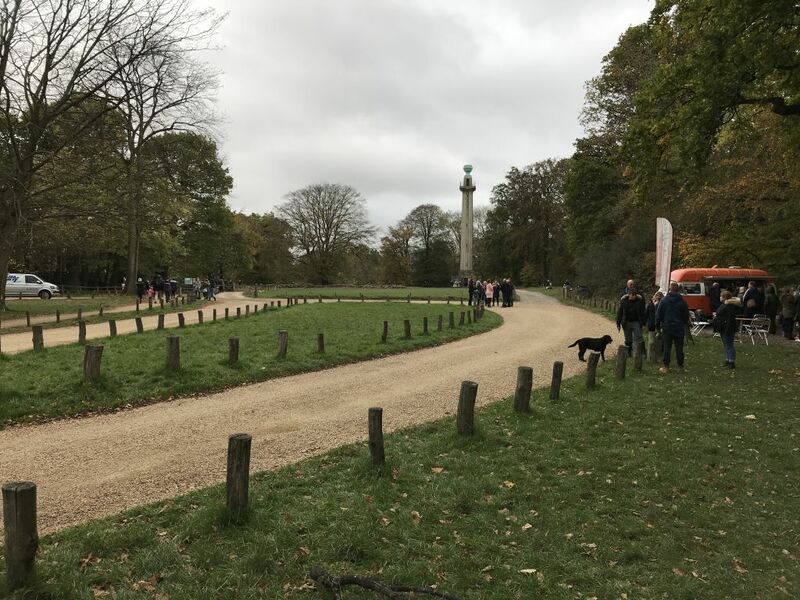 A week after WINTER GEOLYMPIX: ASHRIDGE 2018 it was time to attend another mega event. 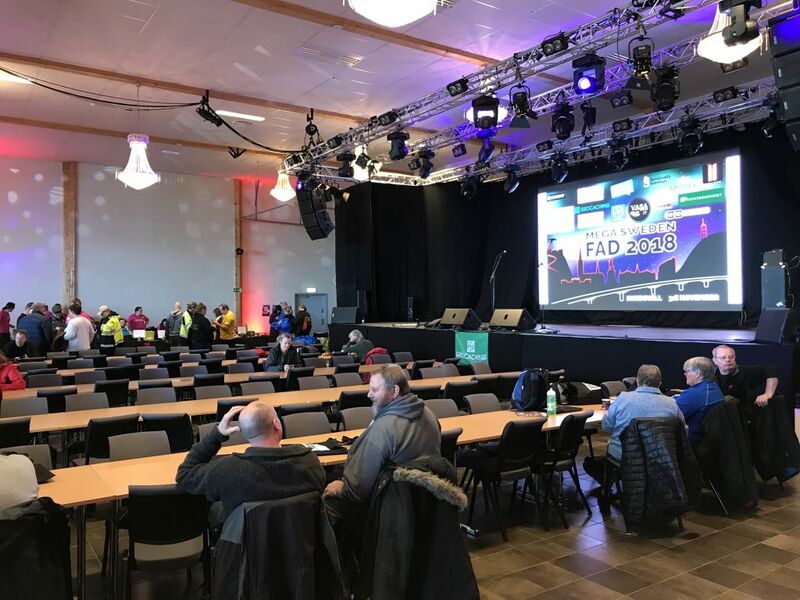 This time the journey was somewhat shorter as the event in question was Mega Sweden FAD 2018 just a 2½ hour drive north to Sundsvall. Last year’s FAD was in Uppsala and I went there with Madchicken and Ironhawk67. This year Madchicken had other engagements so it was just Ironhawk67 and I who made the trip. 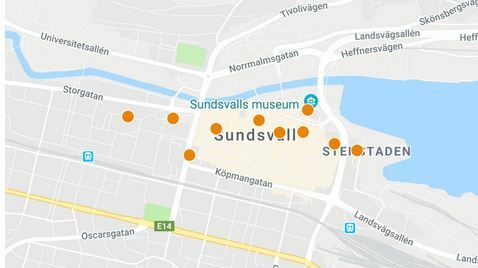 Of course, many other geocachers from Gävle found their way up to Sundsvall but all seemed to make a weekend of it and had driven up on the Friday. We just made it a day trip. We made a short break on the way up to log Amors låda and Gubben i lådan, both with a high number of well deserved favourite points. I won’t spoil them by posting photos. 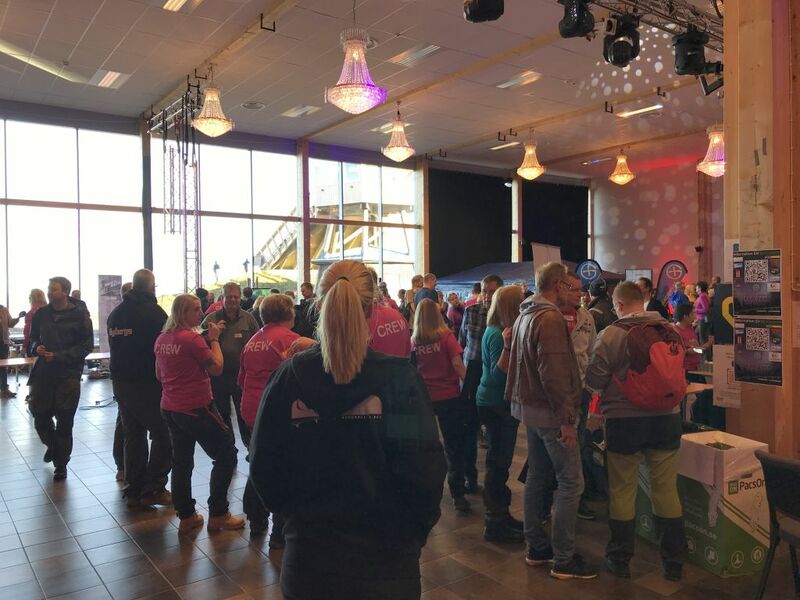 Our first stop in Sundsvall was the Mega itself where we registered and collected little goodies bag then wandered around. 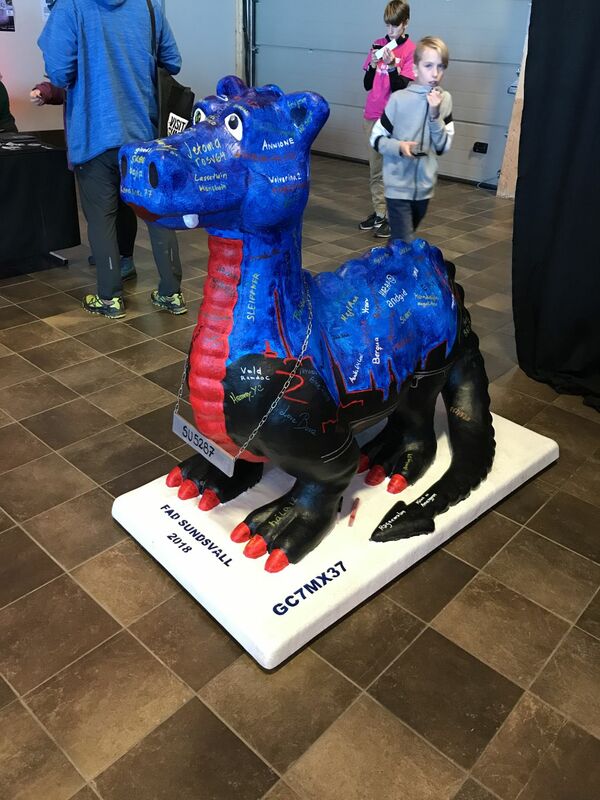 We found the fantastic dragon ”log book” which we duly signed. There were a couple of vendors of geocaching paraphernalia but to my disappointment the prices were much higher than at Geolympix so nothing was bought. I hadn’t bought anything at Geolympix apart from a few AAND’s as I didn’t think that there would be any difference in price but some items I saw were 10 times more expensive in Sundsvall and most twice the price. We then drove into he centre of Sundsvall to do the daytime lab caches. On our way down we stopped for a very sneaky cache GC Sundsvalls Julkalender 2012 #6 St Nicholaus. A handful of people were there when we arrived but it still took quite some time before there was that ”aha” moment. I can see why the cache has so many favourite points. The lab caches formed a multi of sorts with ten different places to visit. Each stop had a hint to the next so doing them in the right order helped even if it was not 100% necessary. Before setting off we stopped by the local kebab place for lunch. We needed energy for the walk around town. 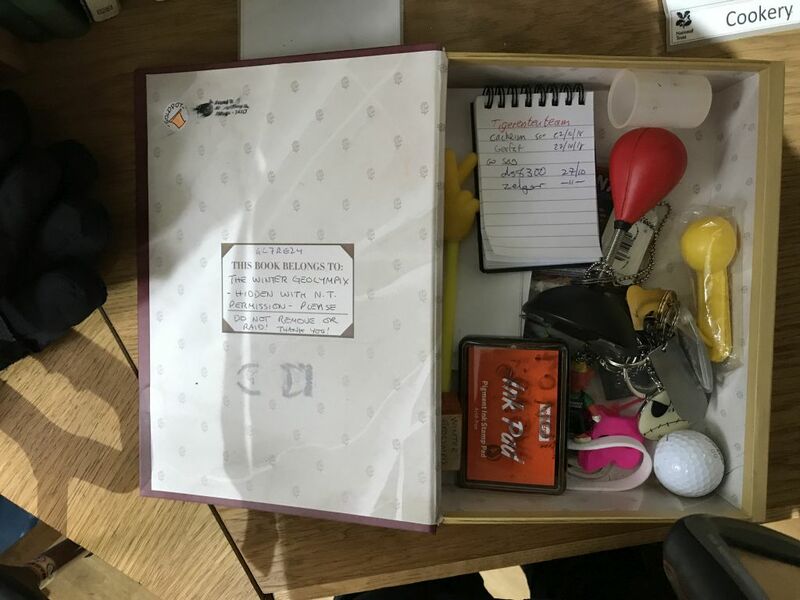 Once the lab caches were all found we ticked off a few trads and a virtual before getting to Panic Room, another highly favourited cache. The container was very special and I must admit to not having seen one like previously. We rounded the afternnon off with a Wherigo Sundsvalls stadspromenad. I couldn’t get the Wherigo loaded onto my iPhone but Ironhawk67 had no difficulties getting it on to his Android phone. In this case the problem was more probably the operator and not the phone. We headed back to the FAD site to load the evening caches (GPS and smartphone) but stopped on the way up to find a couple of simple trads and a nite multi Twin Peaks: Fire Walk With Me. This was a (very) short firetack trail that took us to a box with the final coords. I normally use the standard geocaching app on my iPhone (usually as a complement to my Garmin GPS) but that doesn’t have the ability to load GPX files. I can see that I will have to invest 50 SEK for Cachly or 65 SEK for Looking4cache pro to get that functionailty. I also need to update the OpenStreet Map on my GPS to the latest version as the one I had didn’t show most (hardly any) of the tracks in the area around Södrastadsberget but the smartphone did of course. 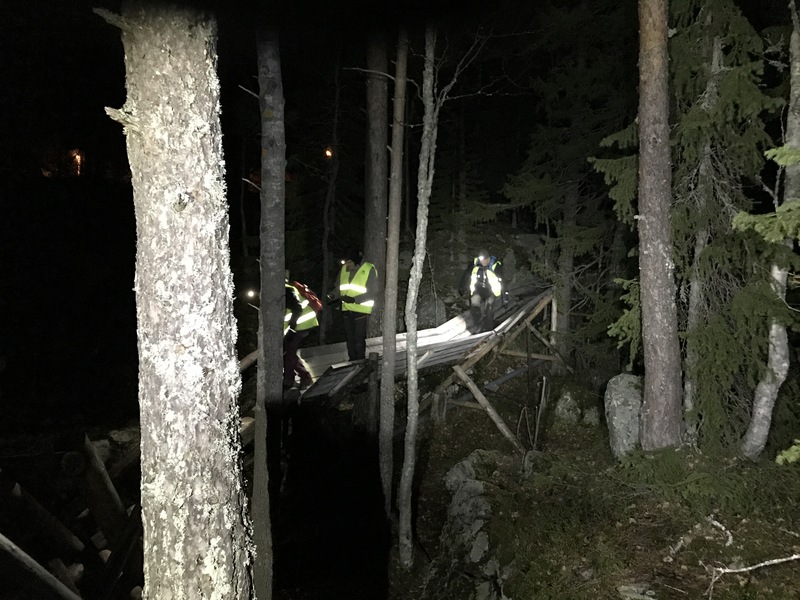 After loading the night caches and warming up we set off again in the dark to find the multi FAD Sundsvall 2018 #1 – Tarzanstigen. There were other cachers out there in the dark and they had fun finding an alternative route to the cache. We found a couple more trads before calling it a day and heading back home. 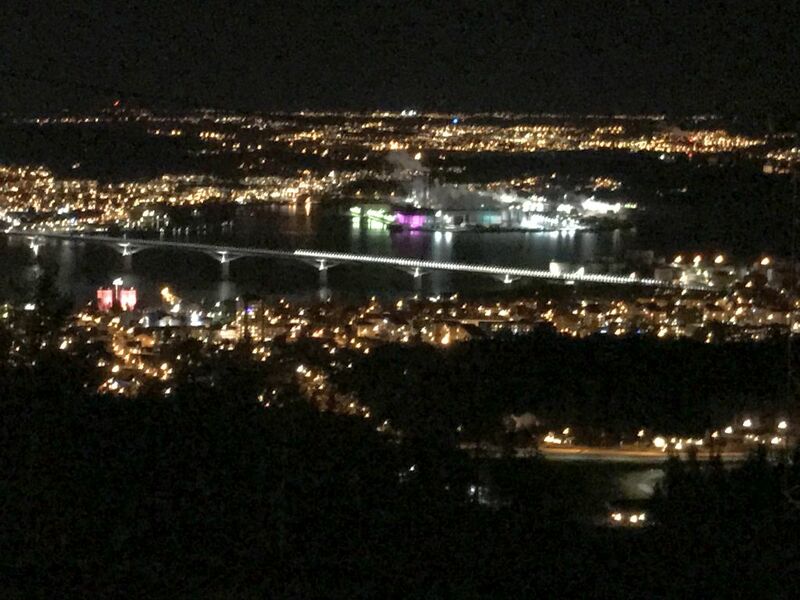 I didn’t take a photo of the view over Sundsvall during daylight so I have to make do with this one in the night. Still quite a good view. Last year I participated in my first Mega event which was Mega Sweden FAD 2017 as it ws not too far away from home. 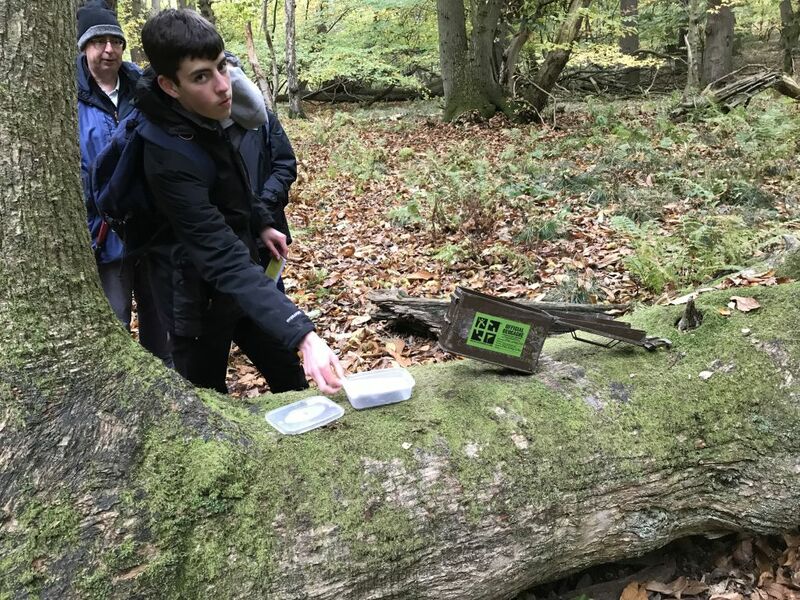 As I still had some frequent flyer miles to use I decided to visit WINTER GEOLYMPIX: ASHRIDGE 2018 as it was conveniently located less than an hours drive away from one of my brothers, and more relevantly the one that geocaches. He is half of ”zelger” and they had never participated in a mega and when I told them about my positive experience at FAD they were in. I am not a keen myst solver and neither are they, however, we scratched our heads on the Friday evening and solved a handful of mysts. There was some lively discussion about how a myst can be listed as a letterbox/hybrid cache and even if we agreed it was stupid to give them that classification just because the CO stuck a stamp in the cache container of what is clearly a myst. It should be classed as a myst. Yes, I have read the geocaching guidelines, but I don’t need to like them. Rant over. We started our journey mid morning and as always in England there is heavy traffic on most roads. When we got to Berkhamsted a closed road got us stuck in long queues. We finally made it and found a good spot to park on the road that passed by the night cache hub near Ringshall. Our reasoning was that there was probably going to be less traffic leaving from there than the main road in to the event site. Ashridge is a National Trust site where the Bridgewater Monument can be found. The main estate is popular for walking free in a forest which is not so easily done in England. As we approached the event location we wondered if everything had been called off. There was a small party tent with no walls for registering at the event and for TB and geocoin exchange. There was no-one looking after that so if you were interested in trackables you just had to hang around and assume that everything there was dropped. When we were there, I was able to find nine trackables. I’m sure that if I had hung around more would have turned up. There was a stall selling a wide array of geocaching goodies and JJEF demonstrating his gadget caches of which I have found quite a few on earlier visits to England. We had a good chat. Otherwise, there were just a couple more stalls and a couple of lab caches that we didn’t bother with. We could log one lab cache and that was by pure luck. As we walked towards the event we met a guy in a green sweatshirt with a word printed on the front of it. We had no idea it was Simply Paul the main organiser. We then found that a lab cache consisted of finding Simply Paul and using the word on his sweatshirt as the key to the lab cache. Easy, peasy as a famous TV chef would say. 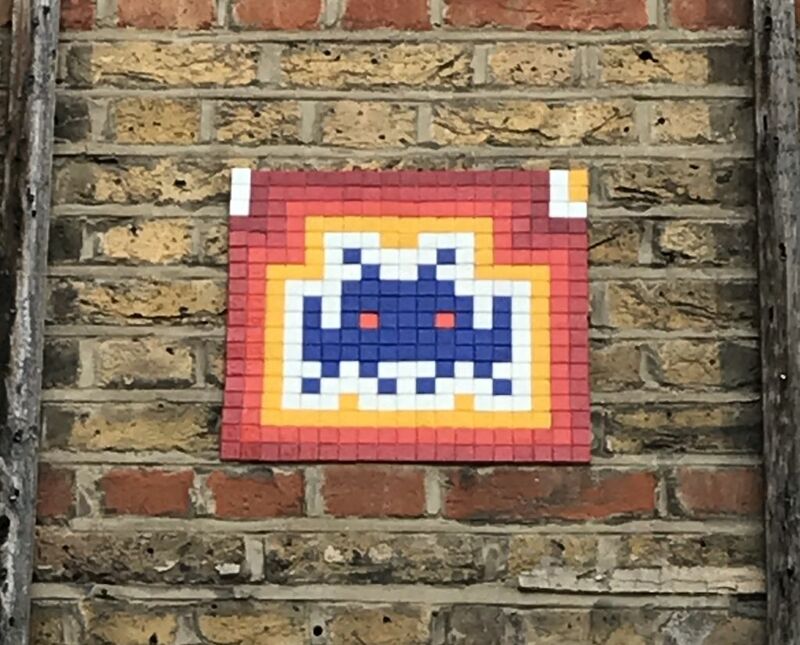 Not hugely impressed, we headed off to find Read The Flippin’… Yada Yada: WinterGeolympix’18. We couldn’t have missed it if we tried. Our path then took us towards Tim & Jon’s 1st Re-Stashed (UK’s 3rd oldest/Eng#2) via The Mossy Tree which was house in an ammo can, a not too common site these days. The Mossy Tree: Join the queue to log it. A few years ago half of zelger and I had been in the area to find Coombe Hill, which is the oldest cache in England together with a very interesting visit to Bletchley Park, so it was great to now find England’s 2nd oldest cache. I’m used to wandering around Sweden’s evergreen forests so it was quite a change to be walking through a forest of deciduous trees. Many of them were sweet chestnuts and there were a few people out picking them up from the ground. Roast sweet chestnuts are a delicacy. We wandered back to the cafe and joind a long queue to get a cup of tea. The coffee was terrible by all accounts. We also took the opportunity to find a letterbox/hybrid cache Rescue This & Save the World! Winter Geolympix ’18 located indoors where we probably spent more time logging the find than was needed, but it was much warmer than outdoors. Of course, we arrived on a dry day that gradually changed for the worse. After early afternoon drizzle we were treated to rain most of the afternoon that got heavier as dusk fell. We found our favourite cache of the day TrOll FREE in the dark as the rain turned to sleet. We headed back towards the car arriving there at 18:30 where we decided that another bunch of night caches probably wasn’t our ”cup of tea” so we left and headed back to zelgers home for a meal and a beer. Will I visit again if the Mega is repeated? I suspect not and it had nothing to do with the weather, just that the set-up mostly based on mysts was not to my liking. After our pleasant family day out in London I spent part of Thursday on my own as the others had to work. I took a local train to Sandhurst which lies about 50 km to the west-south-west of London city. From the station I made an anti-clockwise circuit around the Yately Lake fishing ponds and the nearby Swan Lake Park. 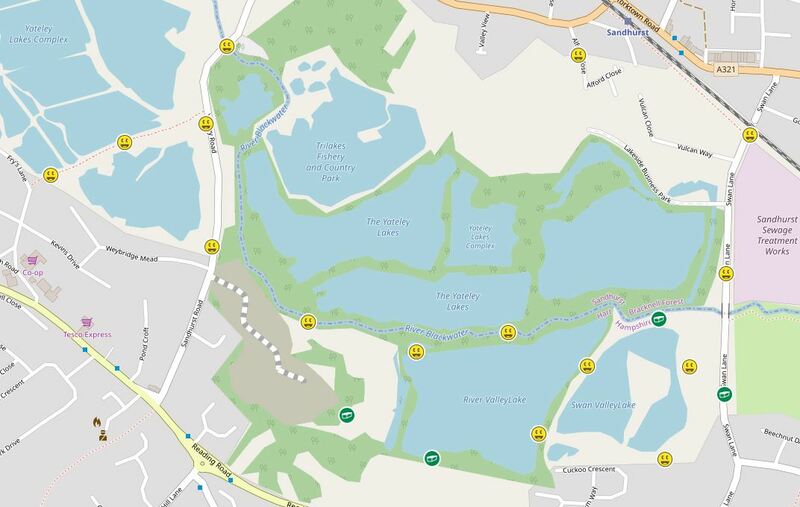 The pleasant walk of about 5km took me to 15 caches of which 12 were placed by the same cacher, VR7. They all had a consistent theme and that was wood. Most were gadget caches or camoflaged in some way, so it certainly made a pleasant change to the PET-preforms that are now so ubiquitous. There were a number of fishermen in the area but it seems that they know that there are caches along the paths so they are used to people ”foraging” in the bushes. At BRPW No 3 I made my 7000th find. 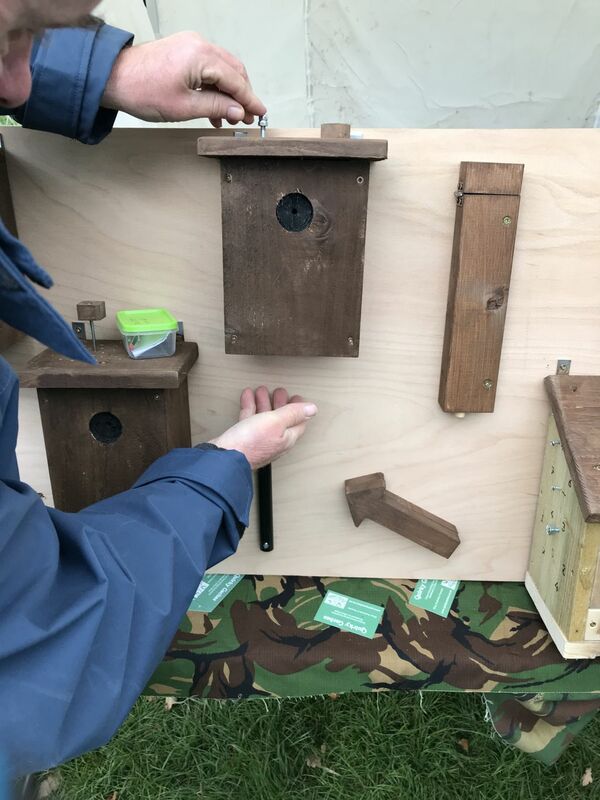 The cache was a birdbox with a simple mechanism to release the container but it was a little different. I wondered what BRPW meant and it stands for Blackwater River Path Walk, so now you know too. 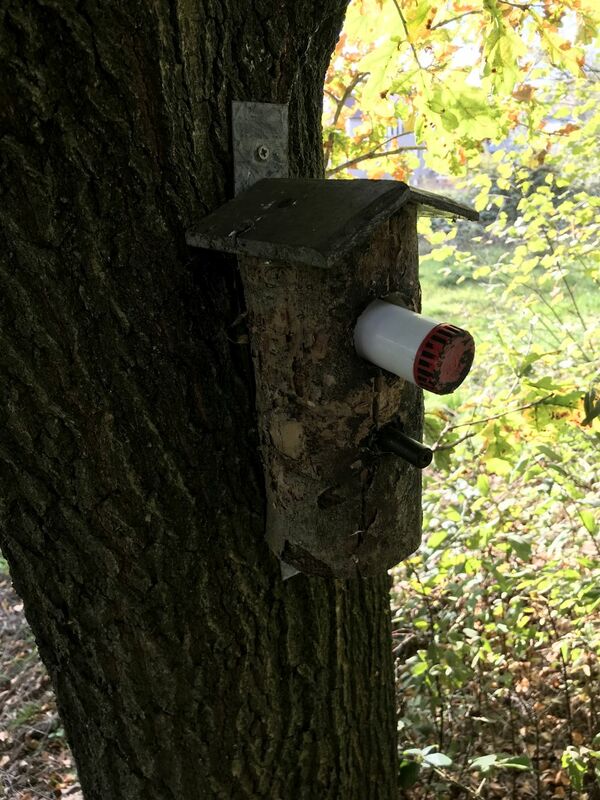 The next cache along, BRPW No 2, was also a birdbox and of course had a different mechanism. The only cache that gave me some head scratching was Under wood. 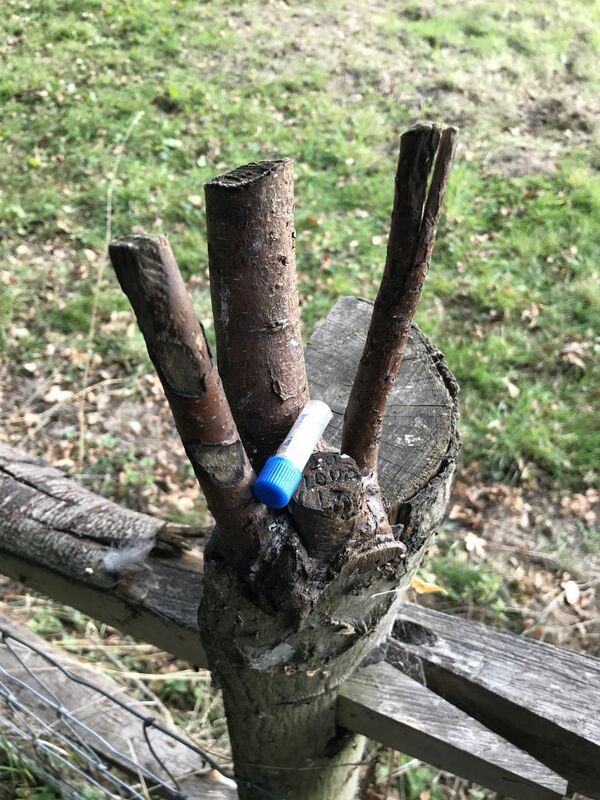 If I had read the clue I would have known where to look and the small log would have been an obvious cache container. 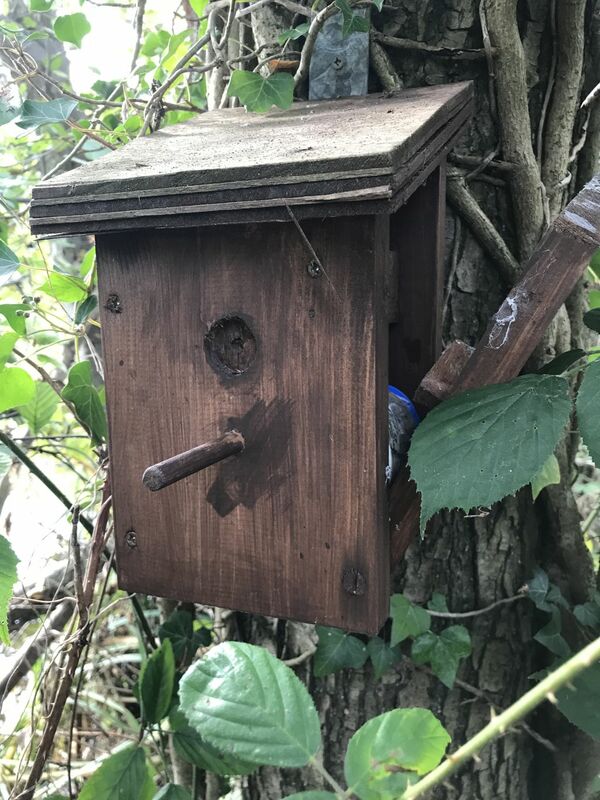 I won’t spoil all the caches by showing photos of them so that means I won’t say which cache this sneaky little hide was found at. A sneaky litte hide barely visible where it was placed. Needless to say all the caches were in good condition and it was a good warm up for Geolympix on the Saturday. My last visit to England was in April but I had no opportunities for geocaching. 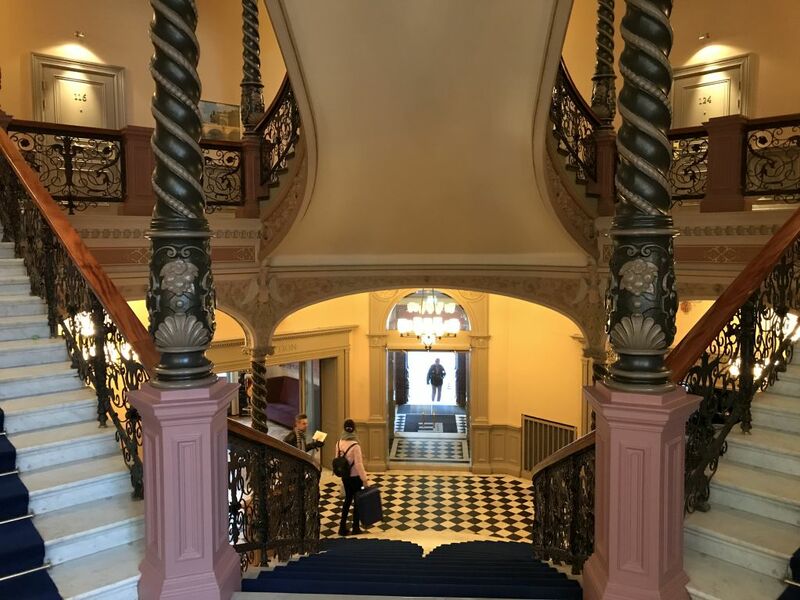 This visit was made in order to participate in GC75FTF WINTER GEOLYMPIX: ASHRIDGE 2018. As it is about an hours drive from where my brother lives it was a great opportunity to catch up with family and make a couple of small geocaching outings. 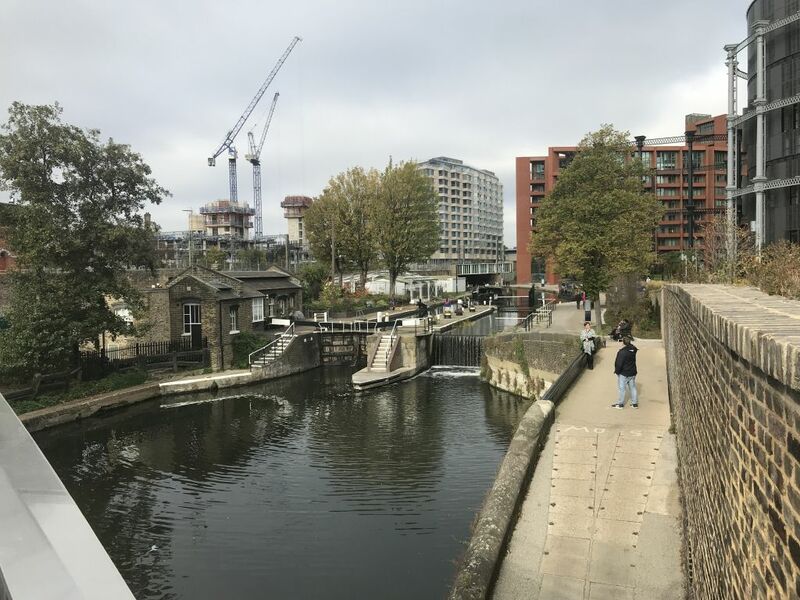 On Wednesday both my brothers, one with his wife and one of the daughters in tow descended on Kings Cross station for a wander around the nearby area of Clerkenwell using the CAMRA Guide to real ale pubs in London as our starting point. 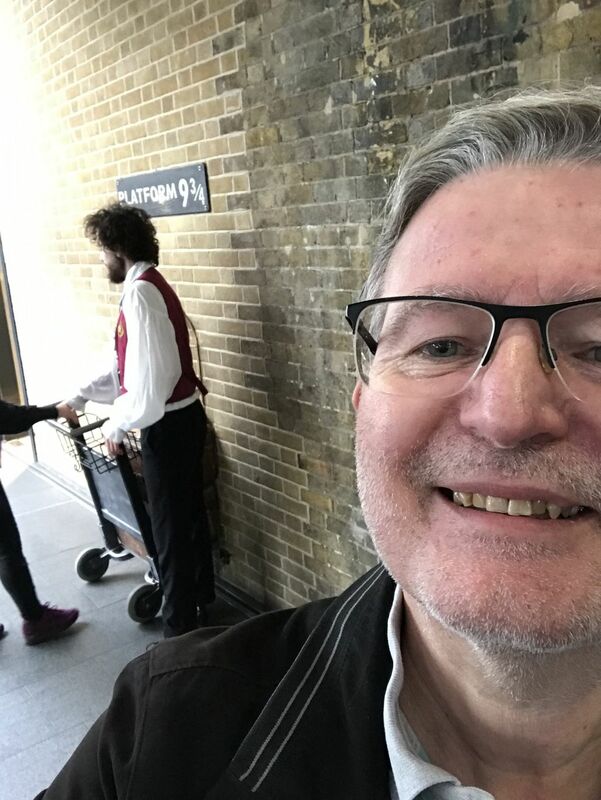 As we were starting our wander at Kings Cross Station it was only natural that we should visit Platform 9 ¾. There was a long queue of Harry Potter fans waiting to have their photos taken with wand in hand. I sidestepped the queue and took my selfie from the side then moved on. 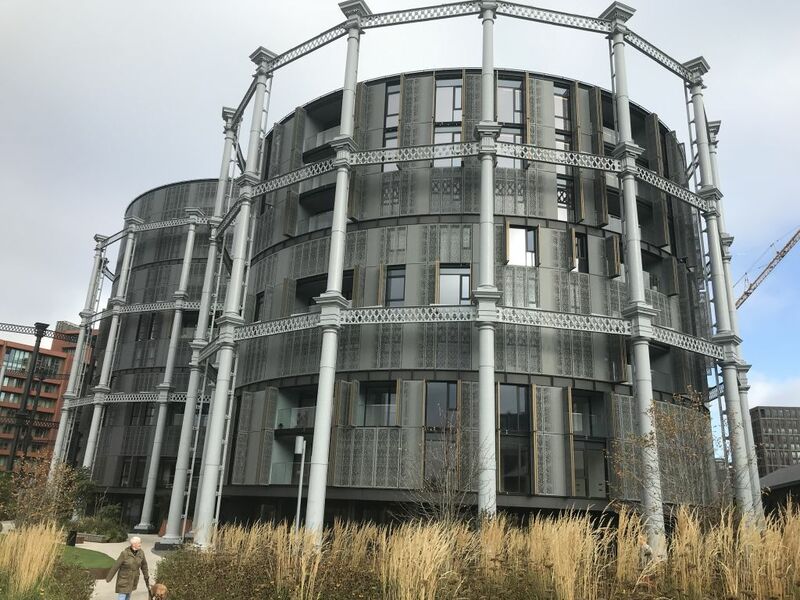 From here we walked north to the Regent Canal and the new gasholder apartments that have been built. The whole area was industrial wasteland for a long time but is now a super trendy and extremely expensive place to live. A penthouse apartment was on the market for £7 million! We followed the canal eastwards aiming for the first pub on our list. Along the canal bank we found Narrow Minded which both zelger (my brother and wife geocaching team) and I gave favourite points to due to it’s construction and placement. I won’t post a spolier photo. 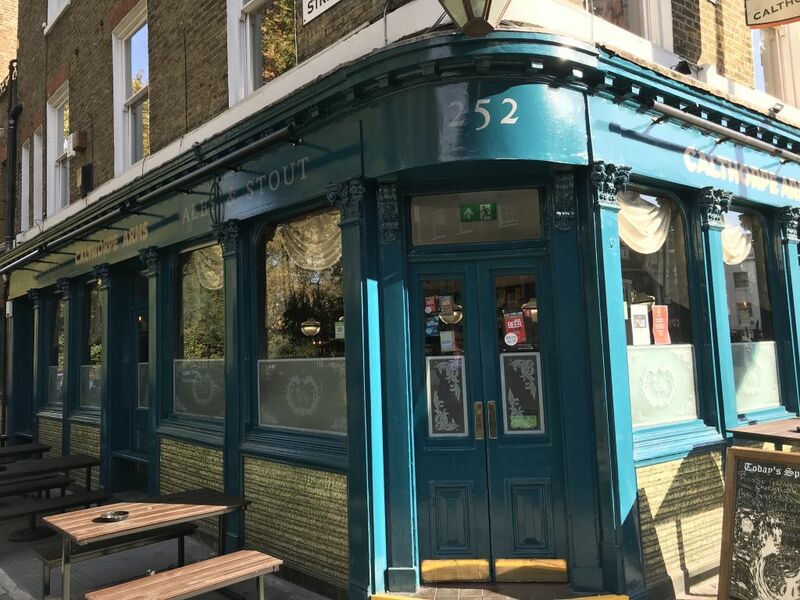 After finding the cache GC3Y2QD Calthorpe at the gates of a small park we wandered on to the next corner and the Calthorpe Arms. Lunch was great value in this pub as was the quality of the beer. From there we passed through a couple more pubs where real ale was served before walking down the pleasant street Exmoouth Market with small ethnic shops, stalls and cafes arriving via a short stop at the Exmouth Arms, at Bone House in Spa Field Park just as a police drugs bust was going on. As zelger really enjoy multis we decided to try The Smoothe Field Mystery and spent an hour or so visiting 7 waypoints before arriving at the cache. As we were also sightseeing it was a great way to see parts of Clerkenwell that we would otherwise have missed. For example, at step 4 we found this bed of nails and behind it a colourful wall mural. The spike were painless according to my youngest brother who tried it out. 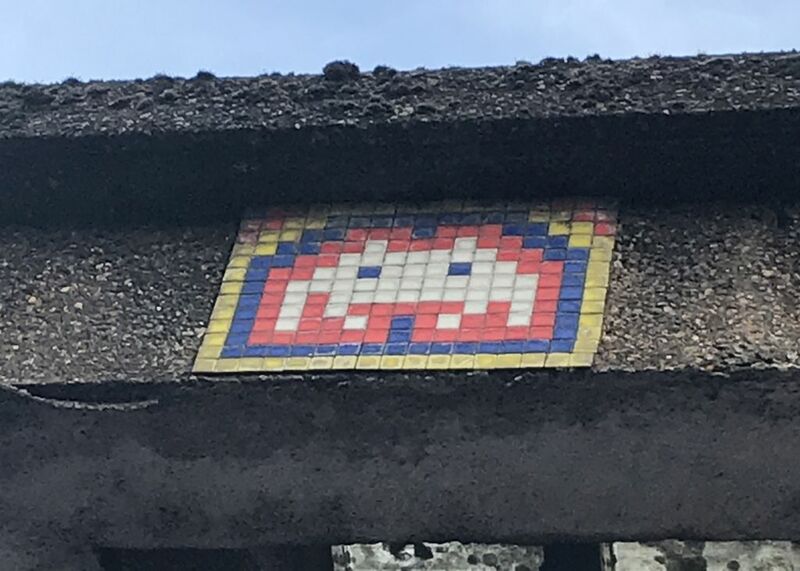 I found the alien mosaics fascinating and it seems that they are a very common sight in Paris but can be found all over the world. I recall seeing one on an earlier occasion but don’t remember where. Near to the starting spot for the multi was a virtual from 2001 that we just had to visit. A Meating place for Martyrs. Yes, the spelling is correct as it is close to the Smithfield meat market. 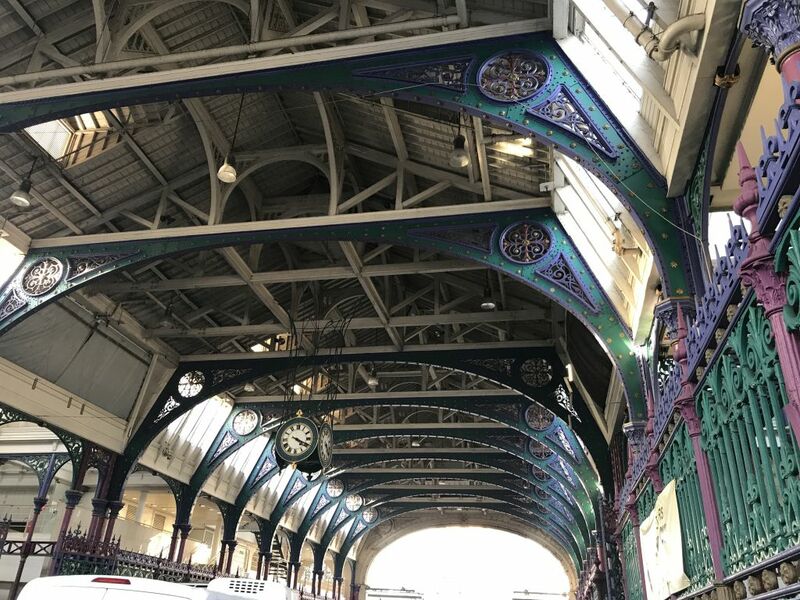 We were now happy with our day in London and headed for the nearby Farringdon tube station to start our journey back out of London.